Finally, a digital piano with authentic piano performance, that’s easy to use, looks great, and doesn’t cost a bundle! 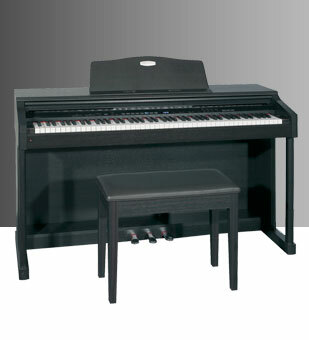 The Galileo ‘Virtual’ Piano 121 starts with an award-winning Progressive Hammer key action. The sound is generated by the exclusive iMotion™ piano technology—allowing you to create all the subtle nuances and emotion of real piano performance. There are 20 professional sounds that can be layered or ‘split’. There’s a handy built-in metronome and 2 headphone jacks for private practice. Interested in connecting your piano to your home computer? The VP-121 has MIDI connections and audio inputs to make computer expansion a breeze. The VP-121 enhances your home with an Italian-designed cabinet, console-style legs and sliding key cover—all in a handsome dark rosewood finish. The Galileo VP-121—an elegant high-performance ‘virtual’ piano —at an affordable price!